I have been playing billiards in Canada in the Winnipeg Veteran’s English Billiard League since 1975. After 3 years of blindly banging the balls about I purchased Richard Holt’s book and I improved my game 100 fold. My highest break was 143 in our Bardal tournament some 15 years ago (thanks to Jack Karnhem’s video). I played in one EBOS tournament last May (English Open) which I consider one of the major milestone of my billiards career and looking forward to playing in more in the near future. 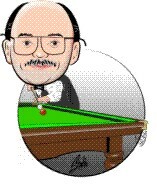 I don’t have much of a life outside of playing billiards except doing custom caricatures online (www.senkiw.com). Formally I had ran my own sign shop for over 20 years. My cue is an old one peice 16 oz. ash cue I resurrected from the trash bin. I had it made into a two piece and a 19 oz. with a 9.5 mm Kumui soft tip.